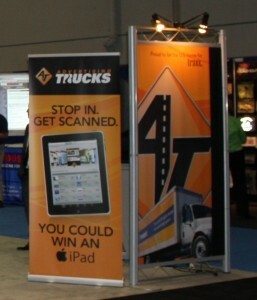 During the past FESPA Americas graphic show Advertising Trucks was collecting names and one lucky winner has been chosen from a list of hundreds to win a new Apple iPad. That winner was picked on February 28 and is Andrea of Diversified Concepts. If she’s out there, have here give us a call to collect her goodies. We will hold her iPad until March 8th. At that time if she hasn’t called to collect her new toy the rest of you still have a chance as we will pick another winner then. Andrea call us at 513-554-4700 to claim what is “for now” yours. I know the rest of you will be rooting her on.